Another in my occasional series of little books from the past. I can’t stand those cosy aphorisms that fly about on social media. You know the sort of thing – all about counting your blessings and the dead being only in the next room. Accompanied by pictures of kittens and rainbows and sunsets. How many of these were sent to France? So why have I kept this? Well, it’s small and unobtrusive. It belonged to my grandfather, who died when I was nine and thus never grew out of being a magical and godlike figure to me. To be honest, I don’t think I ever opened it until now. It’s full of homespun wisdom, about – yes, counting blessings and being kind and temperate. No kittens or rainbows though. In fact, it can be rather bracing. If you are sad it is almost always caused by thinking about yourself. The book was first published in November 2017, when it seemed as if the Great War would never end, and this is the second edition, from May 1918, when despair must have cut even deeper. It is very small – I wonder how many mothers and uncles and Sunday school teachers bought them to send out to the Western Front, and how the recipients might have greeted them. was there: was W.J. Gregg? Granda was too young to fight. His copy was a Christmas present in 1925, when he was a very young man – only 21, I think. I don’t know who the W.J. Gregg, who inscribed it To Charlie, with every good wish was. 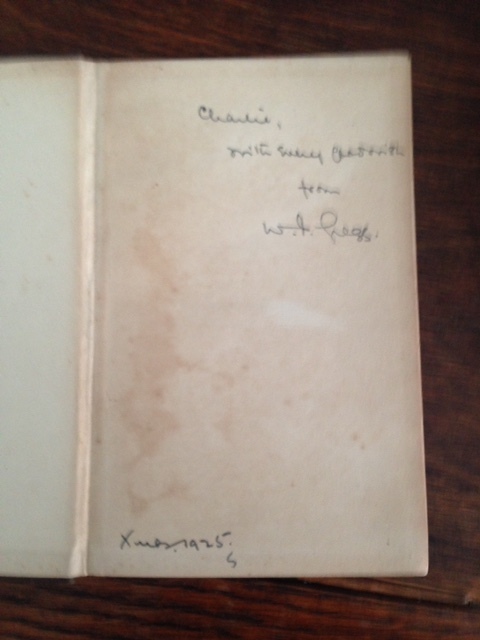 I might have sent it to the charity shop, along with so many others, but for that inscription, especially the informal Charlie. It makes it too personal, too much a part of family history. I have old photos, what my grandparents called snaps, of jolly parties of young men carousing in the 1920s. Carousing, you understand, in a temperate way, often at Sunday School picnics and outdoor church services. Perhaps W.J. Gregg was one of those. Was he William, Wilfred or Walter? William, I suspect. Probably known as Willie, as they so rarely are nowadays. Willie John maybe. Or Willie James. They were close enough friends for him to write Charlie, but distant enough for him to sign his own name formally. Did Granda treasure the book? He certainly kept it, but then he kept everything, as that generation did. And after his death in 1978, Gran kept it too, but she treasured everything of his. It is in good condition, which might mean it wasn’t much read, or simply that he looked after it. As I will. I don’t believe the dead are in the next room, but I do believe something of them lives on in the things they owned and kept. Something of their own joy and gladness, perhaps. Thanks for this, Sheena - a tiny treasure indeed! I love your posts about old books, Sheena.